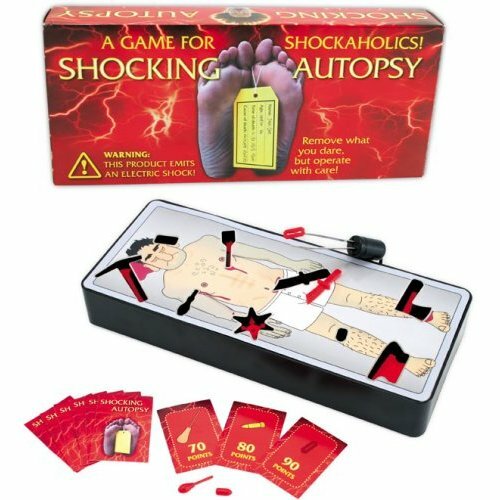 This electronic game of skill is a variation of the classic, "Operation", complete with the suspenseful sound effects you have come to expect from our line of shockers, as well as a few modern twists. The first of which is that you aren't trying to save an ER patient, but rather removing 7 lethal objects, (including a bullet, ice pick, razor and ninja star) from a deceased corpse. So you aren't pressed for time, but don't let the fact that he is already dead allow you to become complacent or careless when operating, because you are going to get it if your hands aren't steady. "Challenging" isn't the best word to describe this game, but it is the first one that comes to mind. Let us not forget, there is also a training "wimp" mode, whereby the shock is replaced by screams for those who prefer a milder version, or need to "practice". So scrub up and take a stab at this game of skill. For 1-4 players. Full game instructions are included, but you are just going to make up your own anyway. 3 AAA batteries required (not included). Now A RARE Out of Print Game! We have just a few left!